Oh, what fun! Our exclusive Santa knows how to keep spirits bright. Invite him to holiday at your house, and save a place for him on the mantel or coffee table. He’s a fancy old soul from head to toe, looking fashionably festive with brilliant touches of gold. Oh, what fun! Our exclusive Santa knows how to keep spirits bright. Invite him to holiday at your house, and save a place for him on the mantel or coffee table. He’s a traditional old soul from head to toe, looking fashionably festive with touches of green, gold and plaid. Our handcrafted sitting Santa in red, plaid and bright green isn’t stressing over the season ahead. In fact, he’ll enter your home displaying the spirit, all decked out in holiday cheer for all to enjoy. A Pier 1 exclusive. As a native of the North Pole, our handcrafted Santa is something of a ski expert, hence the gear he holds while wearing faux fur and plaid garb paired with an Alpine-like hat. The red pants? They go with everything. Heading out cross-country, he’s all set to deliver a decorated tree. A Pier 1 exclusive, his face and hands are crafted of ceramic. When you’re making your shopping list and checking it twice, our white woodland Santa better be on it! Handcrafted of fabric, vinyl and rattan and sporting a lantern, thick faux fur coat and hat, he’s eager to make an appearance on your mantel this holiday season. Your first holiday houseguest has arrived! Our handcrafted Santa comes bearing peace and presents, decked to the nines in a fine ivory sweater and carrying a flocked tree and bejeweled gift. Our Santa and his winged companion enjoy spending quality time in the great outdoors and have gathered everything to make your holiday special. Handcrafted with meticulous detailing, he’s ready to come indoors to warm up and watch all the festivities from your mantel or bookshelf. Your first holiday houseguest has arrived! Our handcrafted Santa comes bearing peace and presents, decked to the nines in a fine ivory and gold coat and carrying a beautifully decorated wreath. When the music starts, our animated Santa’s gotta get his groove on. Who knew that behind the beard, traditional garb, sack full of gifts and candy cane, there’s the soul of a free-styling dancer? The sturdy base he stands on contains the batteries that fuel the big man’s moves. A Pier 1 exclusive. Our handcrafted Santa is beautifully dressed in a faux fur-trimmed red felt coat. A lantern helps light his way as he carries a bag of presents and a tiny tree on his back. He’s the perfect reminder to behave yourself every day leading up to the big day. Santa may deliver Christmas presents every year, but that doesn’t mean he always travels the same path. Every now and then, he may take a shortcut over the hills and through the woods to make sure he gets to every cabin on his list. Our handcrafted version may change out of his traditional red coat into a more festive version. Believe it or not, when he’s not in his suit, St. Nick loves to keep it casual by donning a festive Christmas sweater. With a sack of presents on his shoulder and skis in hand, our Santa will bring the holly-jolly to your entry table, mantel or kitchen island. Fun fact: When he’s not in his red suit delivering gifts, Santa dons forest green and faux fur and heads into the wilderness to commune with nature. In keeping with his woodsman style, our handcrafted rendition of St. Nick even includes touches of genuine pinecones and twigs. A Pier 1 exclusive. Yes, Santa skis on his days off, and why not? Especially when he has such a cool new sweater to show off. He’ll transform any tabletop or mantel into a winter wonderland as he slaloms into your heart. It’s almost impossible to celebrate a Christmas without having a Santa Claus bringing his sweet presents to kids and you. Garland, cranberries, wrapped packages and possibilities! 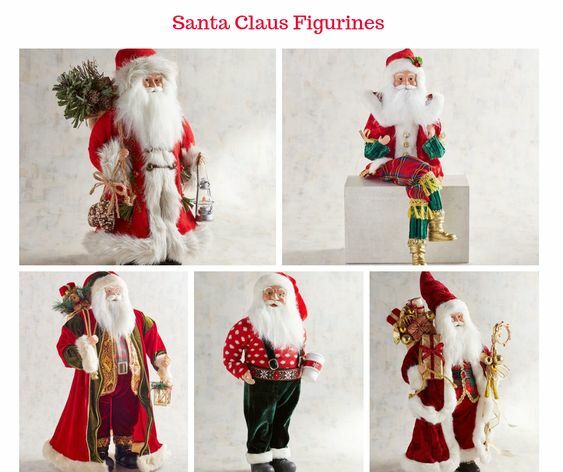 This is one of the best made Santa Claus figurines you can expect for this special season, with all refined textures and fabrics. Perfect for table and entryway. It’s almost impossible to celebrate a Christmas without having a Santa Claus bringing his sweet presents to kids and you. Garland, cranberries, wrapped packages and possibilities! This is one of the best made Santa Claus figurines you can expect for this special season, with all refined textures and fabrics. Perfect for table and entryway. Create your own X’mas corner with it! It’s almost impossible to celebrate a Christmas without having a Santa Claus bringing his sweet presents to kids and you. Garland, wrapped packages and possibilities! This is one of the best made Santa Claus figurines you can expect for this special season, with all refined textures and fabrics. Perfect for table and entryway.